Let’s dispel the myth that women, especially young mothers, need to refrain from ambition or feel guilty if they are ambitious. If you ever feel you might be doing something wrong because you believe you have business or creative potential and want to do something about it, read on. Time to kick those limiting beliefs to the curb! “Ambition” seems to be a loaded word for women. Does ambition collide with feminine virtues of motherhood? Let's take a look: The dictionary defines ambition as “a strong desire to do or to achieve something, typically requiring determination and hard work.” That sure sounds admirable to me! There is room for “ambition” in every area of our lives. You can be ambitious about raising kind, contributing humans. There’s nothing that takes more effort over the course of decades than raising kids. You can be ambitious about improving your marriage, a serious effort for the committed of heart! You can be ambitious about improving your health, which requires you to make changes in your day-to-day nutrition and exercise habits. All of these meaningful efforts require determination and hard work. At The Mama Ladder®, we empower women at the intersection of mamahood and entrepreneurship. Believe this: You are absolutely allowed to be ambitious about growing your company, creating more opportunities, and making more money. Be as ambitious as you want! I’ve learned I don’t need to to waste my precious time and mind power worrying about what other people think. Being out of the corporate ladder really helps because I’m not constantly surrounded by others’ limiting beliefs. 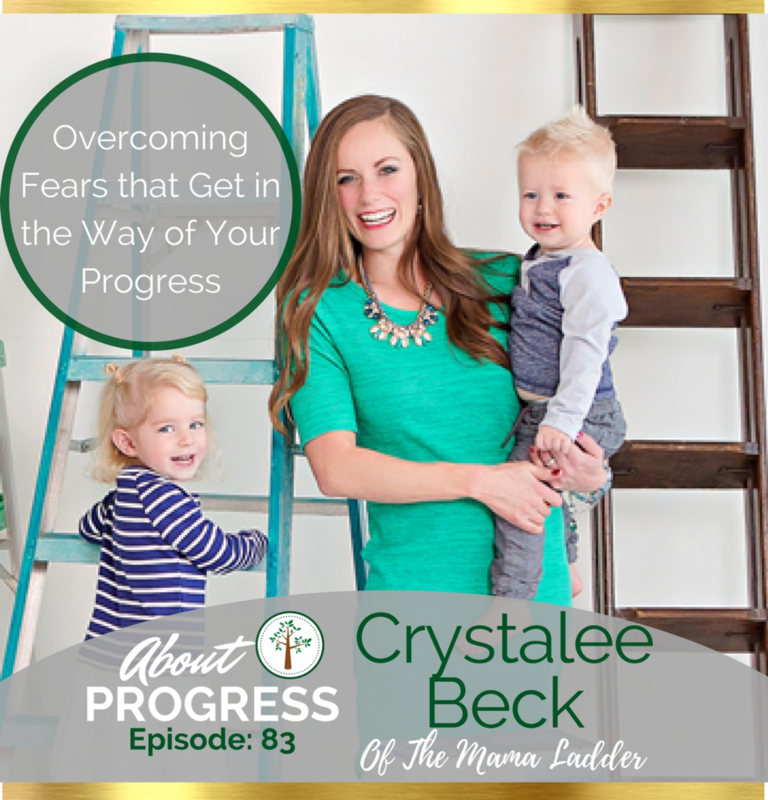 I “create my own ladder” as a business owner and it’s incredibly liberating to set BIG, beautiful goals, and climb after them boldly without needing to hold back due to other people’s fragile egos. Progressing, growing, and learning are your innate right and potential. This ability to move towards your goals has many names, like “the pursuit of happiness” in the U.S. Declaration of Independence. Nature shows us examples of this: Fruit trees are always seeking to grow and create as much fruit as they can. Do they hold back for fear the other fruit trees will feel inadequate? No! They are naturally created to seek sunshine, nutrients, and every possible resource to help them progress. The same goes for you. Progress, grow, and feel good about striving towards your potential! The desires and wild dreams you hold in your heart are there for a reason. Whatever your belief system (God, the Universe, Muse, etc. ), know that the quiet whisperings of your heart are there to guide you towards what you can become and who you can help. If you have a deep desire to do something good or meaningful, listen to it. This could be finally writing that book you’ve always want to write, or collaborating with other brands for a big campaign, or launching new services that will make a real difference in people’s lives. See your ambition as a clue to the good you (and only you) can do for the world. Doing good is not limited to non-profit organizations or church groups. There are countless ways to be big-hearted as a for-profit business. It’s the reason we give $5,000 to a promising mom entrepreneur in our HIGH FIVE grant program twice a year. It’s our dream to truly empower mom entrepreneurs, and we’re happy to put money behind that dream! When you allow yourself to dream and ACT big, you give others permission to do so as well. This includes your child(ren). By showing your kids you believe you are worthy of greatness and your dreams deserve your attention, you teach them they can believe the same for themselves. What an incredible gift to give your children, friends, community, and anyone who your life touches! If you feel ambitious about growing your business, congratulations. That’s a sign you deeply care, and have the ability to do and BE more than you currently are. Listen to that desire, and allow it to motivate you to take bold action. You’ll be happily surprised to see what you can create, thanks to your ambition and hard work to back it up. Want help to climb after your ambitious business goals? Let’s do it, Mama! We specialize in working with women of action who are committed to their babies and their business. Join us and other like-minded mamapreneurs at #MamaSpringBreak. Your business dream, meet our BIG grant. We are thrilled to announce the opening of our $5,000 grant for promising mom entrepreneurs. Starting May 11, mom business owners from around the world are welcome to apply for this grant. HIGH FIVE Grant for Moms™ is a semi-annual $5,000 Business Grant empowering mom entrepreneurs to make massive impact. Hosted by The Mama Ladder®, this grant provides economic empowerment for promising mom entrepreneurs to build their business. At The Mama Ladder®, we see motherhood as your greatest advantage as an entrepreneur, and running a business as powerful training for leading at home. You can find more information about this grant on our oh-so-official press release. Applications open May 11, just in time for U.S. Mother's Day! Mom entrepreneurs from around the world are welcome to apply. A judging panel of successful entrepreneurs (soon to be announced) who support mom-founded businesses will narrow down entries from around to world to just eight (8) promising finalists. Eight (8) finalists will be announced, featuring their business story. (Great way to promote your brand!) From June 11-June 20, 2018 the public will vote on their favorite mom-founded business. The winner of the HIGH FIVE Grant for Moms™ competition announced here! On the one-year anniversary of The Mama Ladder®, we're celebrating by giving $5,000 to a promising mom entrepreneur. Will she be YOU? Thank you to our incredible sponsors, who help make this grant possible. They are moms who turned big dreams into reality. You can too! Katie is a wife, mother of four, business owner, author, speaker and coach. She cofounded www.Puj.com with her husband from their garage and built it into a globally recognized eight-figure brand. She has been featured on the cover of Entrepreneur magazine, and her products have been seen on Ellen, Raechel Ray Show, The Today Show and several other national media outlets. Now she's passionate about helping others do the same thing. She coaches an exclusive group of committed men and women who want to want to take their business and life to the next level. See more about this leader of leaders at katierichardson.com. Author, leadership expert, motivational speaker and mompreneur expert empowers women to become their grandest self! “Anybody can be a mom entrepreneur, but a mom entrepreneur extraordinaire is a woman of balance and focus,” states Lady T. As a corporate trainer and motivational speaker, her client list includes United Way, Fred Pryor Seminars, Bell South, Indianapolis Power and Light, Delta Airlines and Kent State University. Her biggest claim to fame is homeschooling her five children for 22 years. To learn more about Lady T’s services and publications, visit www.thebusinesscoachformoms.com. We want to see you have big MOMentum in your business. Apply and let's see what you can do! The constant triage of mamahood never really goes away—do I finish making dinner, or stop my boy from wiping Vaseline on our suede couch? (My boy really did this. Ahh!) Do I watch my pregnant friend’s kids for her while she goes to the doctor or take my girl to dance practice? These kinds of questions get more complicated as a business owner, especially if you work at home part (or all) of the time: Do I play outside with my kids or stick them in front of the TV while I work on marketing content? Do I finish the laundry or schedule meetings with clients? Your attention will always be desired by more people, activities, and goals than may seem humanly possible. Even for a super mama like you! But fear not. What you CAN do is protect your time by scheduling specific “chunks” that are dedicated to your business. It may seem counterintuitive, but when you protect work time, you’re also protecting time for your family. We’ve met with moms who feel overwhelmed with the time required to run a business. It feels like they are constantly checking their email or on social media. And they want that to change. They want to be present, happy moms. They also want to climb after business dreams. We fully believe BOTH are possible. But it requires protecting your time. · Your work matters to you. · You set healthy boundaries. · You honor the creative process. · You value what you’re sharing with the world. · You will be available to them when your work time is over. That last one is important – without setting specific times to work, you risk blending business and family so there’s no intelligible difference between the two. That’s “anything goes” territory becomes an exhausting, overwhelming downfall for too many mamas in business. It’s not fun for you, your partner, or your kids to have an overworked mama. So don’t let it happen to you. Schedule work time, and stick to it. Does this make you selfish? No, Mama. Think about the commitments your kids have. For example, if your son is on a soccer team, you both know he’ll spend Tuesdays from 4-6 at practice and Saturday afternoons at games. Do the same for yourself. Schedule a babysitter for the hours you want to commit to your business, and show up. Get your work done. Then when you get back to your kids, you’re fully present. And we think a mama who values herself and what she’s sharing with the world is the best gift she can give her kids. We’d love to help! To identify your best time blocks and create an ideal life/work situation that works for your work, schedule a PowerStep Session. One of the most-asked questions we get from mamas in business is, how do I make the TIME for business while raising my babies? It’s a legitimate question, especially for a go-getter mom like you who wants to do it all, and do it well. (Right?) The truth is, we all have access to the same number of hours each day. But there are ways to multiply yourself with a team and with tools that maximize your time. So, without further ado, here are seven FREE apps that save us time—and sanity—so we can spend more time with those we love most, and that's what we call a h(app)y hour! All of these apps are free—some start with a free trial, but at least you can getting a taste and know if it works for you. For full disclosure, some of these are affiliate links. But that just means we both benefit from sharing them! Wanna make invoicing easier and even, dare we say ... FUN? For two years I've relied on Freshbooks for invoicing clients. It's sleek, easy, and the support team is super helpful. You can a free 30-day trial by clicking here. Typeform lets you build beautiful online forms & surveys with great completion rates. Click here to try it out. If you upgrade, we both get 10% off for life! Doodle is a free polling app, specifically for setting meetings with multiple people. Instead of sending out an email, “Let me know a time that works for you in the next two weeks,” and being bombarded with emails to sort through, you set up options and your attendees pick their preferred date/time. Once you’ve Doodled, there is no going back! A social media scheduling tool, we’ve been using Later to plan our Instagram account for more many months now. As of this writing, Instagram does not allow pre-scheduled posts. But clever Later lets you write posts in advance and be notified when you’d like them posted. With a quick click, it’s shared. We love that Later gives us an advance peek of what our Instagram grid will look like. This free scheduling app gives you a slick way to automate appointment scheduling. We use it to have mamas schedule 90-minute PowerStep sessions for clarity on their ideal Life/Work Vision and baby steps to climb after it. As the name suggests, this easy-to-use app helps you send agreements and get signatures easily. We use this for our #MamaSpringBreak Alumni to sign our Event Waiver before our amazing retreat. We could just HUG the team at Asana because we use this project management app all the time in our business. You set up projects and invite contributors to those projects. Everyone has visibility into upcoming deadlines. You can upgrade for more permission-based access, but for our purposes, the free version has worked really well. And here's a bonus No. 8, just for you! We’d rather eat last week’s burnt leftovers than sit down and track business miles. MileIQ is the #1 mileage tracking app, trusted by hundreds of thousands of users every day! It’s just not our thang. So, when we found MileIQ, we were pretty happy to find an easy solution that pays us back at tax time. Try it for free and get a 20% discount when you upgrade. Which of these apps have you used? Any others you recommend? Pop in a comment below. Check out how we can help you MULTIPLY YOUR TIME with a talented business team here. It's your year. Your year to face your business fears, try something new, and surprise yourself with what you can accomplish. Why not you? And why not 2018? You'll find just what you need at #MamaSpringBreak Business & Adventure Retreat. Here are 10 reasons why this special event is made especially for the adventurous mamapreneur. When & Where: It will be March 15 - 17, 2018 in gorgeous St. George, Utah. 1. Get business training from experts. In one weekend you'll learn how to protect your business legally, be smart with business finance, set up processes, master your leadership mindset, and take notes on marketing strategies. We've lined up a keynote you'll adore who is gonna let you know why being a woman and a mother are your biggest assets! 2. Adventure outside in gorgeous Zion's National Park. Forget a stuffy seminar. No, Mama! This retreat is about fresh air, happy vibes, and climbing greater heights. What better way to do that than with a hike? We'll see the sights from atop Angel's Landing, a famous hike in the southwest. 3. Forge lasting friendships with like-minded mamapreneurs. You'll meet women who love their babies AND their business at #MamaSpringBreak. They are coming in from across the U.S. We've got mamas signed up from Illinois, California, Utah, and Oklahoma ... all there to learn with you. 4. Attend a Pat Benatar rock concert at the gorgeous Tuacahn Amphitheatre. Because who doesn't want to rock out to "Love is a Battlefield" from the legend herself? THIS will be so rad. 5. Give yourself a kid-free getaway that's a business expense. Because we all need breaks from diapers, dishes, and laundry that never seems to end ... right? It's just three days, and they will sure be glad to see you when you get back. 6. Bring home more than $200 of sponsor gifts! Our sponsors are ahhh-mazing and you'll get gift cards and products from: Chatbooks, RadSwim, Baby Cubby, Modern Piggy, Mommi, Brightbox, YNAB, SmartShyp, and more! 8. Enjoy having your food taken care of! No cooking or cleaning for you, Mama. We've got you covered. All meals and healthy snacks are included. 9. Shake what yo' mama gave ya. We'll have our own dance party, just for attendees. Woot. 10. Relax in a soothing yoga session. We've got an incredible instructor coming who will get you feeling serene. Convinced you need a #MamaSpringBreak in your life this year? Sure, we'll have a really, really good time. But we'll also stretch our hearts, bodies, and minds so that we can all climb (literally and in business) in 2018. Invest in yourself, and your business. See you there, Mama.